Perhaps it’s the wrong time to be writing about such a hearty winter dish just as the sun is rising over the mountain for another glorious day of Alpine sunshine. But there we go. Apparently it’s raining in the UK. A good french onion soup is dependent on a number of well executed techniques. Firstly, the onions must be cooked gently to a golden brown colour to take advantage of the delicious flavours produced by the Maillard reaction. This process occurs when the denatured proteins of an ingredient recombine with the sugars present when heated. The Maillard reaction is often talked about when frying a piece of steak but is equally important when cooking vegetables to bring out their natural sweetness. It’s why people often add a little sugar when roasting their carrots – it’s a bit of a cheat to help bring out the natural sugars of the carrot as they start to turn colour. Secondly, a good stock is very important to give the soup an interesting depth of flavour. At The Tasty Ski Company we make our own beef stock but you can find some good stock cubes in the supermarket, ask Marco Pierre White. Finally, a good reduction of alcohol is important. It is the same process as when you make any classic french sauce. We use red wine but also ruby port – we like the sweetness of this port (as opposed to tawny), to bring along the flavour along with the sugar from the onions. 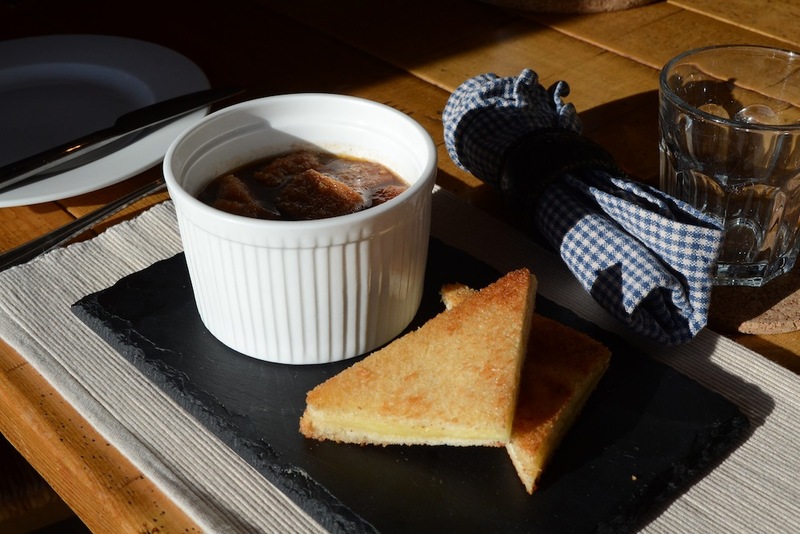 At Tasty Ski Company we serve the soup with homemade chunky croutons and mini croque monsieurs on the side. This is not really necessary, but it is traditional (and delicious) to serve with melted gruyere cheese. You can always sprinkle some cheese on top of the croutony soup and place under a grill until melted and bubbling. Sweat the onions and star anise gently in vegetable oil until golden brown. This will take anywhere between 20 – 40 minutes. Add the red wine and reduce by half. Add the port and reduce by half. Add the stock and thyme, then simmer for 20 minutes. Cut about 8 rough cubes per person from a baguette. Mix generously in vegetable oil in a bowl then place in a 150 degrees oven until golden and crisp throughout. Remove from oven, let cool to room temperature then place in a sealed container until ready to serve.